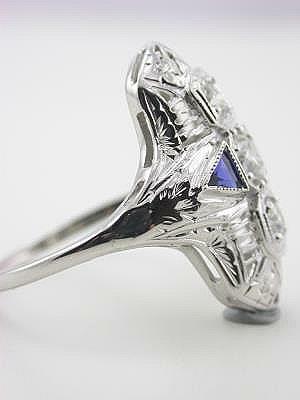 The 18k white gold setting of this Art Deco antique filigree ring is fashioned in a North-South design and makes a lovely dinner ring. Sapphires at the shoulders at a touch of color. 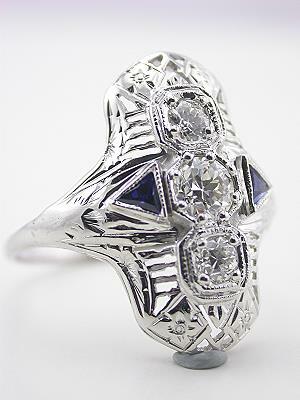 The filigree is this antique ring is accentuated with a pair of triangular faceted mixed cut blue sapphires. 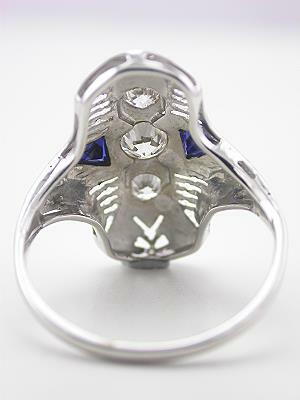 These sapphires weigh 0.10 carats . 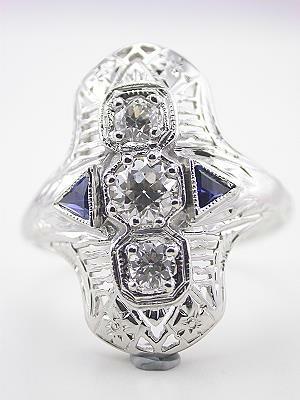 A trio of old style round brilliant cut diamonds is set down the center of this antique dinner ring. Totaling 0.49 carats, they range in color from E to G and in clarity from VVS2 to VS1. Circa 1925.